Darling Cora is the singer-songwriter project of composer and finger-style guitarist Darlene Cuevas. With a supple voice brimming with soul and grace, thoughtful lyrics, and a unique guitar playing style, her songs capture inner, emotional truths that are often cloaked in sunny grooves and progressive folk rock. Her aim is to prompt listeners into feeling and experiencing the beauty and range of the human condition. She is also known for her sprightly instrumental guitar tunes. Amid a summer heatwave in Toronto, Darlene Cuevas hammered out her debut record, Heart Strung Out, released under the stage name Darling Cora. On the nine-track album, the Canadian singer-songwriter tackles what it means to love and be loved as a young woman navigating both the victory and tragedy of the heart. The album is releasing August 19th but Elmore has the exclusive full album stream below. Setting the style for the rest of Heart Strung Out is opening track “Sugar,” as hypnotic as it is lush and full of dark, swirling colors. Later, “Two Lovers” follows its lead with a dull percussive thump trailing Darling Cora’s deep, elusive voice. On “Charade,” her 60s female-folk influences are accentuated by breathy vocal play and a more playful rhythm than the others, while the last track “Empire Of Yourself” combines all the previous elements of the record for a sleepy, spellbinding conclusion full of instrumental solos, powerhouse punches, and neverending melody. Experimenting with otherworldly sounds concocted from a percussion-based composition and vocal fluctuations, Darling Cora feeds us the spooky, raw inner workings of her mind. Through poetic songwriting and an eerie type of creativity, she releases Heart Strung Out as a confession (and a guidebook) to women everywhere. Elmore Magazine: What is the music scene like in Toronto and how has it influenced your own work? 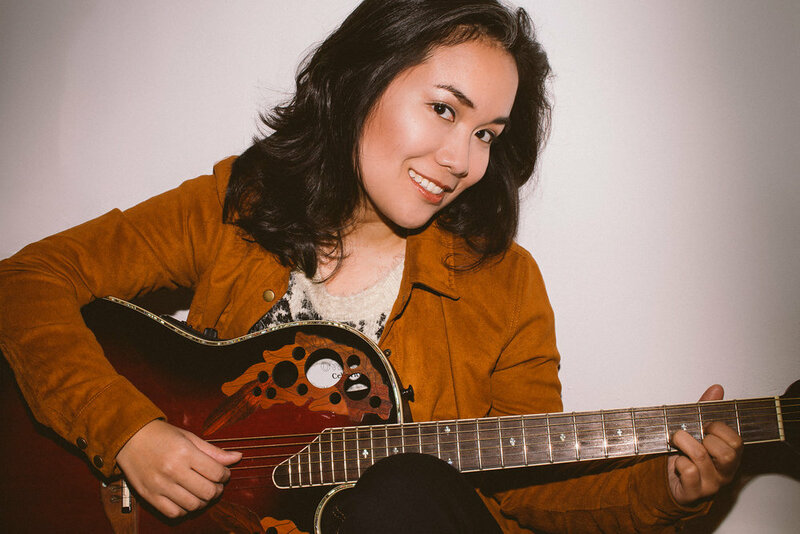 Darlene Cuevas of Darling Cora: The Toronto music scene is a bustling melting pot where Canadian musicians from all regions, styles, and backgrounds flock to in order to “make things happen”, much like how it is going to New York City or Nashville. As such, there is often pressure to stand out amongst the white noise created by such an abundance of talent, and I have seen this lead to both musicians making each other better along the way, and to others succumbing to pressure and petty jealousy. I feel that it is a rite of passage to encounter both of these at some point along the way, and it has shaped my music in that I have learned to trust my own musical voice and judgment as it stands, apart from those who never had any good intentions to begin with. EM: What was the production process like for your debut album, Heart Strung Out? DC: Production got delayed for a few months, and to be honest, I was not entirely sure when the album would get started until a few weeks before. It was a bit of a mad dash scramble to get things done once we did get around to it, and definitely a test of each other’s endurance and patience. Making the record was seriously intense – I had never felt under such pressure to deliver my best stuff in such a short amount of time, basically over three days during a bit of a Toronto May heatwave, which was hard because of a medical condition which makes it hard for me to control my body temperature. That, along with my nerves, almost pushed me over the edge. My producer Jaron Freeman-Fox did an exceptional job shaping the direction of the recordings, and I adore his additional string arrangements. I give my hat’s off to his dedication and expertise. I came in thinking I was more prepared for the process than I really was, but in the process of having to realize that, I learned SO much about recording and about what I need to work on in order to grow as a musician and writer for the future. EM: Which is your favorite song on the record and why? DC: I absolutely love how the lead single “Yearn” shaped out, but my favorite would have to be “The Story” because of a little happy accident behind the crackling sound on the track. Literally the day before I had to lay down my guitar part for the song, I tripped and fell at a gig, along with my precious Gibson semi-hollow. I was able to continue that show without a hitch, but for some reason, there emerged a very noticeable crackling sound whenever I played my guitar hooked up with all the audio gear and equipment at the studio – and especially for this song. I was horrified and embarrassed that I somehow let this weird sonic quirk happen – but I credit my producer’s ingenuity in shaping the additional strings and banjo parts to make that crackle sound surprisingly welcome, and I have since learned to love that little “imperfection”. EM: Where do you get your songwriting inspiration from? DC: I wish I could pinpoint exactly how and when I come up with my songs, but to be frank, there is no definitive rhyme or reason to plan for when inspiration will strike. I have just been fortunate enough to realize when to keep things rolling once the seed or spark of a new song emerges. Part of it is influenced by what I go through in my personal life, and part of it is just an inexplicable urge to create something I consider beautiful. EM: Who are your biggest musical influences? DC: An artist usually likes to keep their “bag of influences” a bit of a secret, and I subscribe to that view, but it might be pretty obvious to listeners that that I am influenced by Jeff Buckley. But I say that not as a throwaway influence to try to come off as more legit or better than I really am; I say that because I share Buckley’s affinity for absolute vocal commitment, emotional intensity, and veracity. I aspire for that ‘holy grail of sorts’ in my own work. I am also very much influenced by the songwriting of pre-Kid A Radiohead, Neil Young, Joni Mitchell, and Martha Wainwright. Review Fix chats with singer/songwriter Darling Cora, who discusses the inspiration and creative process behind her debut LP “Heart Strung Out,” which is set for a August 19 release. Review Fix: What was your invitation to music like? Darling Cora: I have been drawn and called to music in more ways than once, but the first time I realized I could sing was when I was nine and fully prepared to have my music class laugh at some tune we all had to sing individually. To my surprise, when it was my turn, they all actually applauded. That was totally unexpected, as I had been bullied a bit by others because of how squeaky and annoying the tone of my speaking voice sounded! Funny how that works; I still think I sound kind of odd when I am speaking. Review Fix: How would you describe your sound? Cora: My sound is an alternative-indie folk rock that runs the gamut of emotional expression, best embodied in how I sing. I take pride in my ability to emote and express with a good deal of depth and range – I try to sing with as much intensity, commitment, and authenticity as I can. I am rather obsessed with sounding and being authentic to who I am and the emotional meaning and intent the song, almost like “method acting” but more personal and exposed. That takes precedence over always sounding “pretty and perfect”, especially in a live setting. That, and I tend to be attracted to guitar sounds with a lot of reverb, at least right now. Cora: For better or worse, I have an artistic temperament, and I take full advantage of it. I usually write songs based on musical ideas that I come up with on one of my more intellectual and technically-minded days, combined with the spark of a story and feeling, when the inspiration strikes. I rarely come up with the entire song all at once. It usually requires a good deal of writing and rewriting over time, and through performance. Review Fix: Who influences you musically? Cora: I think one’s musical influences are shaped by all the music, sounds, and teachers that they are exposed to throughout their lives, the good, the bad, and the unsought. However, in terms of the music that I look up to and have idealized, it would have to include Jeff Buckley, Martha Wainwright, and Radiohead. I used to be really into the electric guitar playing of Jimi Hendrix and Jimi Page before that. Lately, I have been really getting into the acoustic guitar textures and playing styles of early Bruce Cockburn and Bert Jansch, and that of my guitar teacher Maneli Jamal. Cora: After my first tour of the east coast of Canada at the tail end of this summer, I will start to prioritize playing with a band more and more. I have played solo for the majority of my career thus far mainly out of necessity, but the time has come to take performing with other musicians more seriously. In the near future, I hope to be playing with others least as often as I perform solo. Cora: “Yearn” is my most accessible song on my debut record; it would stand out amongst the most people for its simplicity and heartfelt appeal to true love, or at least an honest belief in it. It was written on a waves of a manic love high, somewhat based in reality. That fantasy has since broken, but it was one hell of a ride while it lasted. I will leave the specifics to your imaginations. Review Fix: Bottom line, why should someone listen to your work? Cora: I believe my songs and music are unlike anyone else’s – they are uniquely my own voice and musical concoction, and I would hope that that uniqueness is a breath of fresh air in a field where the majority tends to sing, write, look, and sound the exact same way. I am different more in ways than one, and I have come to embrace fully that. That, and I am all about emotional honesty and range – that is what I strive for, and what I will continue to strive for, in my work. I am technically new to the scene, but I am only getting started. Come follow me along my musical journey, it should be quite interesting. Cora: Just as much growth as an artist and musician as I can handle – writing and exploring new sounds, territories, and stories, both in my music and in the process of getting it out there. Looking to become more of a regular presence in the Canadian music scene, and to become export ready over the next few years. Darling Cora (a.k.a. Darlene Cuevas) has a secret weapon — it’s an impossibly supple voice that conjures the mysteries of the ages. It soars, glides and flutters overhead with the grace and fluidity of birds while deftly accompanied by electric and acoustic guitar and strings with occasional touches of soft percussion that combines the best of classical, folk, jazz and shades of world music visited by exotic gypsies from a bygone era. Her astonishing debut album, Heart Strung Out, is a rich bouillabaisse of all these ingredients, yet the music never upstages her hypnotic vocals. Instead, it complements her beautifully, creating magical settings for her to truly shine. One of the biggest mysteries of life is love. Some spend their entire life going through partner after partner looking for it, others never even come face to face with it and then there are those who spend time writing about it, and all it entails. The latter are artists like singer-songwriter Darling Cora. With her upcoming release, Heart Strung Out, she’ll tackle all aspects of the four letter word and more. She talked about that, along with finding her niche in Toronto, what we’d find in her time capsule and more. Kendra: Toronto has a vital music scene. Have you found your niche in it so far? Like do you have a crew of musicians who you have their backs and they have yours? Darling Cora: Finding my niche, whether in Toronto or Canada or anywhere, is an ongoing process, to be perfectly honest. I am not your typical female singer-songwriter. Coming from a Filipino background, no one really expects someone like me to be into the music that I go for, play, and write – the Filipino-Canadian community included. That being said, I have always identified with those who consider themselves a bit of an outsider, or friendly interloper – and maybe that is a really hipster thing to think, but I draw my sense of identity from being slightly alternative, because I think that is where anything interesting is to be found. These are the types of musicians I am drawn to, along with those whose quirks and egos I can tolerate. I am steadily building my musical “crew,” in Toronto and beyond, to answer your question. Kendra: Your latest single, “Yearn,” is about longing for that one true love BUT when the time is right for it. Do you believe that we all have that one person out there for us? Darling Cora: Part of me wants to really believe in the “one true love” soul mate kind of thing because it is very romantic and makes finding the right partner seem so easy and carefree. But I think REAL love is far less wishy washy and fairy-tale-like. It takes genuine effort and commitment to really, and continually, choose to be with, and love, the one you end up choosing. It’s more than just fate; it is a responsibility that one has to be ready and willing for. Kendra: Will your album, Heart Strung Out, have a lot of similar themes as the single? Darling Cora: The entire album is basically about being overly “in love with love” – it covers pretty much everything from heartache, longing, obsession, narcissism, love-in-death, insecurity, security, vulnerability, and its sweet innocence. That, and the kitchen sink. Kendra: You did mention that this album is a time capsule of sorts of younger years in love. Other than the memories, what actual physical items would we find in your time capsule of when you were say, 16? Darling Cora: Great, and potentially embarrassing, question! Oh wow, I was a sheltered keener girl back then, more interested in books than anything else. I hadn’t had a relationship with anyone at that age yet, and I was not mature enough to handle anything more than a harmless schoolgirl crush. If I had to pick actual physical items, it would probably be my “secret” diary which I am pretty sure everyone of my siblings probably read. And I’m glad they did, if they did; it would’ve been hilarious. Kendra: Let’s talk about something totally out of left field for a second. You’re a celtophile…which means you’re obsessed with the Celtic ways of life. When did that emerge in your life, and are we going to hear that sound on the record at all? Darling Cora: I studied English literature for a while before dropping out and eventually switching to music. During that time I was a young sponge absorbing everything I could. I covered the entire British literary canon, from Beowulf to T.S. Eliot. Over time I started to identify with writers and poets from countries that had begun to question and assert their own identities outside of the British Empire – especially James Joyce. So the fascination started with Joyce, and I guess it just stuck. Kendra: Other than dropping Heart Strung Out, what else do you have on the plate for the rest of 2016? Darling Cora: I will be working on finding and prepping the right group of players to join me in the future, for various types of gigs and settings. Also hoping to shoot and release a music video for “Yearn”. Kendra: Going back to the idea of true love, if you had to make a mixtape for a couple who just found the one – what fives songs would have to be on it? "This tune is truly special. It starts out pained, focused and inward but opens to illuminate an emotional story and sonic landscape as big as all of our sadnesses put together. The voice of Darling Cora (Darlene Cuevas) has a delicious range, vivid color and a soothing, comforting feel. She sounds like the Mona Lisa, the Rower’s Lunch and Nighthawks. Please give her a listen." "'Yearn' glides though its 4 minute running time with grace and beauty, showcasing the soulful elasticity in Cuevas' voice"